Why should the Church ever listen to heretics? How do you define a heretic in the first place? 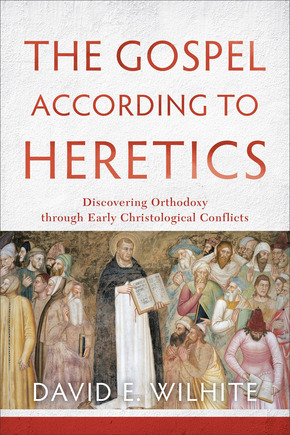 In David Wilhite’s engaging and informative introduction to the early christological conflicts of the Church, The Gospel according to Heretics, he takes on these questions and more with admirable clarity, depth, and sensitivity. Wilhite teaches at George W. Truett Seminary in Texas and specializes in the study of North African Christianity in late antiquity, giving him a good background for taking readers into the world of the Patristic era. In much traditional Christian thinking, heretics were viewed as evil and malicious (p.2). They were to be avoided and their voices were to be silenced if efforts to persuade ended in failure. The early church father Irenaeus, in his work Against Heresies, records that the Apostle John supposedly once fled from a building in order to avoid the heretic Corinth’s (3.3.4). Ignatius also exhorted readers in his Letter to the Trallians to, “cover up your ears in order to avoid receiving the things being sown by them” (9). This need for critical reading arises simply because of the admitted bias of the orthodox sources. They explicitly claim to be attacking what they think is a false and even dangerous teaching. The orthodox writers, therefore, have tried to tip the scales in their favor as much as possible—something everyone did at that time” (p.4). He also warns that those attempting to critically read orthodox and heretical sources must avoid repeating the mistakes of the 20th century search for the “historical Jesus” (p.5). It’s all too easy to produce a historical reconstruction of the past only to find out that it has sadly become a self-portrait. Complete objectivity may be unobtainable, but that doesn’t leave scholars stuck in a morass of absolute subjectivity. Wilhite correctly argues that, “Even if we accept Nietzsche’s claim that ‘there are no facts, only interpretations,’ we can also move past him with Clifford Geertz and insist that some interpretations are better than others” (p.7). Throughout the book, he takes readers on a case-by-case basis through ten early Church christological controversies, from early ones like Marcionism and Docetism to later struggles such as Apollinarianism and Monophysitism. To get a clearer picture of Wilhite’s project, let’s briefly look at his discussion of the Apollinarian controversy. The story of Apollinaris begins promisingly enough. His father, termed Apollinaris the Elder by historians, was a priest in the Laodicean church. Both father and son hosted the famous anti-Arian figure Athanasius on his way back to Alexandria at the end of his second exile. Apollinaris was a strong proponent of Nicene christology (pp.130-131). Unlike the Arians, Apollinaris had no difficulties affirming Jesus’ fully divine status (p.131). The problem, as Wilhite puts it, is that, “Apollinaris, with other Apollinarians like Vitalis, so emphasized Christ’s divinity that he allegedly lost sight of Christ’s humanity” (p.132). This Greek word has the sense of “existence.” The question is whether it implies something’s inner being (i.e. essence) or whether it refers to a specific being (i.e. individual or entity). If it means “inner being,” then it would be synonymous with “essence” or even “nature,” and then God the Father and the Son are one hypostasis/Being… On the other hand, if it implies an individual, then God the Father and the Son are two different hypostaseis, or (we would say) persons. (pp.134-135). Apollinaris sided with the Nicene view that hypostasis should be understood to mean (in English) “person,” rather than “nature,” thereby affirming that the three persons of the Godhead are three in person while one in essence. He went on to insist that the Word of God incarnate was one hypostasis, not two. Wilhite tells readers that, “Some of his opponents could hear this statement on the incarnation as reverting to the earlier meaning of hypostasis as nature, as in the Word incarnate’s one nature” (p.136). For orthodox writers, this was a problem. Wilhite explains that, “For Apollinaris’s enemies, this idea has several possible implications. One is that Christ might only have a divine nature (clearly Apollinaris is not Arian), and therefore that Christ’s one nature/hypostasis is not human” (p.136). Another possibility would be that Christ only appeared to have a human nature, which falls into the error of Docetism. Apollinaris defended himself against these accusations by asserting that Christ was one hypostasis/person and therefore can suffer “in the flesh,” where the flesh is understood to mean the outer person or body (p.137). Wilhite adds, “Whereas the inner person is normally identified as the soul, Apollinaris simply taught that the Word was Christ’s inner person. By using the term ‘soul’ to express his idea, however, Apollinaris raised a number of problems” (p.137). Conceptually the Greek word for “soul” (psyche) included things like the experience of human emotions and human reason. If Apollinaris’s Christ lacks a human psyche, then how can He be thought of as fully human? It seems that Apollinaris did not actually wish to deny that Jesus had a human psyche. According to Wilhite, Apollinaris later shifted his terminology and argued that the Word of God took on a man flesh and a human soul, but that the Word of God replaced what is normally thought of as the human mind (nous in Greek) (p.140). Ultimately, orthodox writers still saw this as an inadequate explanation of Jesus’ full humanity and divinity. In response, they argued that if being fully human means having a human body and soul, and a soul includes a human mind, then the Apollinarian denial of Christ’s nous still resulted in a subhuman Jesus. In the words of Gregory of Nazianzus, “But if He has a soul, and yet is without a mind, how is He man, for man is not a mindless animal? And this would necessarily involve that while His form and tabernacle was human, His soul should be that of a horse or ox” (Letter 101). Ultimately, Apollinaris’s teachings failed to satisfy the famous axiom previously employed against the gnostics heretics. Again, from Gregory of Nazianzus, “For that which He has not assumed He has not healed; but that which is united to His Godhead is also saved” (Critique of Apollinaris and Apollinarianism). By failing to truly assume a human body, the gnostic Christ failed to save/heal the human body. In the same way, orthodox writers concluded that by failing to truly assume a human mind, the Apollinarian Christ failed to save/heal the human mind, or worse yet, that Apollinaris did not see any need for it to be saved/healed in the first place (p.142). More often than not, it was only in response to some heretical teaching that the Church formally articulated Christian doctrines (think of the Patristic councils like Nicaea and Chalcedon). In Wilhite’s eyes, this doesn’t necessarily mean that the Church was “making up” doctrine. I like how he explains it when he writes that “‘the search’ for orthodox doctrine is not a defense of previously stated doctrine, nor a complete fabrication, but a search for something that is real and waiting to be encountered and discovered” (p.251). Wilhite’s The Gospel according to Heretics is a fascinating introductory work that takes readers on a guided tour to the depths of the debates. It’s a good first read for those who are curious about why terms like homoousios were worth fighting about. Even for those like myself who have read a few books about early Church heresies before, it is an enjoyable book that is worth the read. I recommend it. This entry was posted in Book Reviews and tagged Apollinaris, Athanasius, Book Reviews, Christology, Church History, David Wilhite, Early Church, Heresy, theology by joecrow91. Bookmark the permalink.